Another hat completed. While I have knit this pattern before, I didn't remember it being quite so long, but I guess I was wrong. The pattern is well written and easy to follow, with the exception of the needle sizes: the pair of sizes for the circular needles is different than the pair for DPNs. Not sure what that is all about. I used a ribbed cast on. Another hat, same yarn, same pattern as the previous one but the k2p2 ribbing version. Even though I tried to follow the pattern exactly this time, I still think the crown is wonky. Anyway, having a warm head is what is most important. Usually I knit socks for xmas, but this year that seemed like a bit much. I don't want to work that hard! So it will be hats all around instead. I don't know why I had so much trouble getting this simple project underway, but I started it at least three times, switched needles twice, and still goofed it up (see modifications above). Since I didn't realize my ribbing mistake until I reached the crown (and was NOT about to start over at that point), the crown is a bit wonky. Sometimes good enough is perfect. Handknit cotton dishcloths last forever, or so it seems. Unless, of course, one is careless with a knife or there is a weak spot in the yarn. I'm not sure which happened, but the dishcloth in current rotation incurred a serious injury. My first instinct was to toss it, but decided to try to fix it instead. Thanks to the miracle of blogging, the original post regarding this dishcloth may be found here. This one is the "ridge and rib" pattern. Even though the cotton yarn had nearly felted from long use, I was able to tink back one pattern repeat. The only Sugar 'n Cream yarn I have is this stinky one, but it worked fine. The old green yarn feels somewhat fragile, so we'll see how long this poor dishcloth lasts. Executing the repair was a good exercise, though, something that would not be possible with a store-bought dishcloth. Next I would like to learn to darn socks. Socks are my go-to portable project, although sometimes I work on them at home, too. Especially toes and heels and bind offs. Still, it took me a while to finish these. Almost three months, in fact. The Vintage Kitchen colorway came in one of the anniversary kits offered by Simply Socks Yarn Co. I don't usually purchase kits like these - my idea of a project bag is a clear ZipLoc - but I really liked the fabric pattern AND the yarn colorway. And I am really enjoying self-striping yarn. Whether the stripes are narrow or not-so-narrow, the color combinations are very satisfying. No fancy sock pattern for these babies. The stripes say it all. Yesterday I attended a workshop billed as From Animal to Product at the Big Red Barn near St. Joe. My goal was to get some hands-on experience with picking and washing fleece, then carding the result. The reality was heavy on the picking and washing, light on the carding. No pics at the event itself because our hands were busy. We each received two small bags of fleece, sheep in one, alpaca in the other. 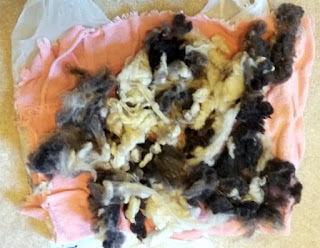 We picked the sheep wool, washed it about four times, then rinsed it and laid it out in the sun to dry. We also picked the alpaca. The two fleeces were very different to work with, the former denser. We didn't wash the alpaca there - running short on time - but we were able to take it home to continue the lesson on our own. 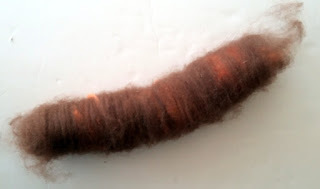 We used a drum carder on some already carded alpaca, blending in colors as desired. Since I had to be somewhere, I worked a little orange wool into the undyed alpaca, just to say I had done it. 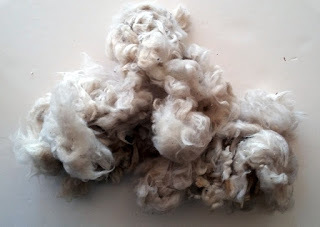 I have some experience with drum carding already and was hoping for more practice with hand carding, mainly because I do not have $$$ to spend on a drum carder of my own. The Big Red Barn "rents" time on their drum carders, so I do have access, but I still want to learn to work with hand carders. Just looking at the chubby rolag makes me itchy to get back to spinning. So much fiber, so little time! 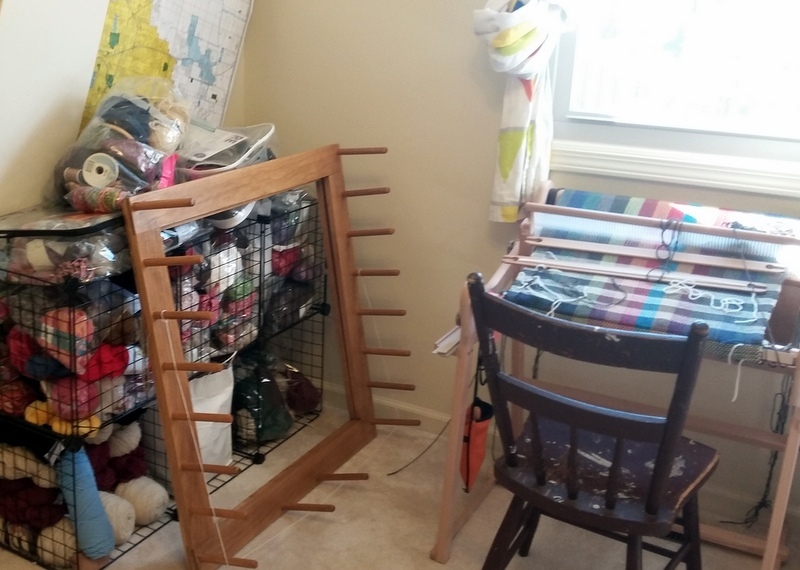 This morning (and not for the first time) I struggled with claustrophobia while trying to weave. 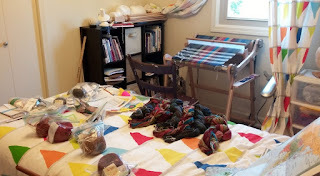 Once upon a time (last spring), I thought about creating a fiber studio, then decided my whole house could be my studio since I live alone. 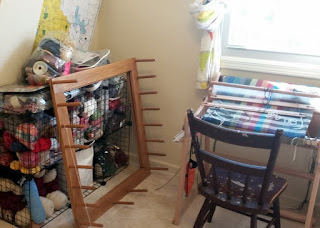 The yarn goddesses had a good laugh about that, after Beau the Destroyer of All Things Nice knocked the warping board off a table and the warping board knocked over and broke an Ott lamp (and its CFL light bulb - call the EPA! ), and the lamp knocked over a planter. 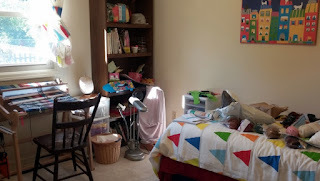 I moved most of my yarn stuff into the spare bedroom that my granddaughter considers "hers" - it contains a certain amount of pre-school crap and a bed she has never slept in - where I can shut the door against a certain marauder. Even though the arrangement felt cramped, I resisted moving the bed because of the headboard and the picture over it, and making the bed is easier when it is in the middle of the room. But today I had had enough. The bed is now against the wall, and the fiber library shelves and yarn wire shelves have swapped places. This means I can scoot my chair back more than six inches, and I have room for my wheel if I feel the urge to spin. 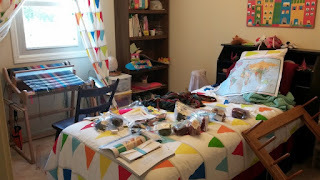 I also find myself staring at all that yarn, wondering what I should knit/weave next. So much fiber, so little time!